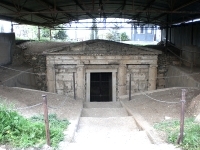 Vergina, known in ancient times as Aigai, is the most important of a cluster of three archaeological sites in the area connected with Philip, father of Alexander the Great. Vergina is where Philip built a massive palace and a theatre, and where he was assassinated in 336 BC. The palace has been excavated, as has the theatre, and the site also features hundreds of burial mounds, some dating from the Iron Age, across the plain. The tomb of Philip was found here undisturbed in 1977, full of treasures that are now on display in Thessaloniki's Archaeological Museum. The vast palace is full of amazing mosaics and paintings and is really exciting to explore, as are the tombs, which are surrounded by a museum and can be seen in all their ancient splendour. The site of ancient Aigai has been declared a UNESCO World Heritage Site and is a privilege to explore for those with an interest in ancient history and archaeology. Nearby is Pella, the remains of the former capital of Macedonia from the 5th century, where Alexander the Great was born; and Dion, an important religious sanctuary once frequented by Philip and Alexander.